The global gamification market was valued at USD 4.3 billion in 2017 and is further anticipated to witness a CAGR of 30.7% during the forecast period (2018 – 2024). Gamification technique is used by individuals for assimilating persistent game design for everyday operation basis in order to encourage and involve people in order to attain their objectives in an effective manner. The growth of the market is anticipated to be high due to the increased capability of this technique to satisfy the needs and desires of an individual pertaining to their virtual achievement and position. It has been observed that the accomplishments in this technique are measured through scores, points, and level crossing, Moreover, the ability to upgrade the overall experience of the users is another factor pertaining towards the growth of gamification market across the globe. On the basis of the solution, the gamification market is segmented into a consumer-driven solution and enterprise-driven solution. Among these two segments, the consumer-driven solutions contribute larger revenue to the global market and are predicted to witness a CAGR of 25.7% during the forecast period. This segment is contributing the largest revenue since consumer-driven solutions are considered to be user-friendly and flexible and are extensively being utilized for amplifying loyalty and motivation of customers towards various products across several different industries. On the basis of user type, the gamification market is segmented into small and medium enterprises and large enterprises. Among these two segments, a small and medium enterprise is expected to witness faster growth of 35.4% during the forecast period. Gamification techniques are enabling small and medium enterprises to reevaluate the method that leads to producing results with the help of processes, people and technology. On the basis of application, the gamification market is segmented into sales, marketing, product development, support, human resources, and others. Among all these applications, marketing has been contributing the largest revenue to the global market. The segment is further expected to witness a CAGR of 28.4% during the forecast period. The growth of this segment is attributed towards increasing marketing events with the use of levels, virtual goods, credits, leaderboards, and points. On the basis of industry, the global gamification market is segmented into media and entertainment, e-commerce, retail and consumer goods, banking, financial services, and insurance, travel, and logistics, entertainment, education, healthcare, and others. Among all these segments, the education sector is predicted to witness the fastest market growth during the forecast period. Increasing demand for gamification technique in the learning process as compared to that witnessed by the conventional methods of learning is expanding at an escalating rate. It has been observed that in the present scenario there are several learners in various business organizations and enterprises that feel motivated by getting enlightened through rewards and points. Moreover, an extensive explosion of social media platforms, an increasing number of millennials in the workplace and expansive utilization of mobile technology are the key trends witnessed in the gamification industry, globally. The massive explosion of social sites is due to an entrenchment of reward and position components that are explicitly and implicitly used for people’s engagement with online groups, thereby fueling the growth of the gamification market. Moreover, the rapid demand for gamification applications and solutions in business organizations and consumer brands is further driving the growth of the global market. The absence of improvement in the designs of the game in various developed as well as developing economies is expected to hamper the growth of the gamification market. However, less awareness and low accessibility about gamification technique along with understated effects on the attitude of users is further hampering the growth of the market. Globally industry players are leveraging market growth through technological advancements, providing strategic assistance to the clients along with mergers and acquisitions in the gamification market, globally. Moreover, the key players are offering offers such as information management, data mining and revenue enhancement ideas and solutions. Geographically, North America has accounted for the largest share of more than 45% in 2017 and is further anticipated to witness considerable growth during the forecast period. The growth of this market in the region is attributed to the extensive adoption of an enterprise-based and customer-based solution in this region. In order to aggravate the marketing activities of their organizations, countries such as the U.S. and Canada are rapidly adopting gamification technique with the use of effective branding, advertising, and customer interaction. These factors are thereby accentuating the demand for gamification market in this region. 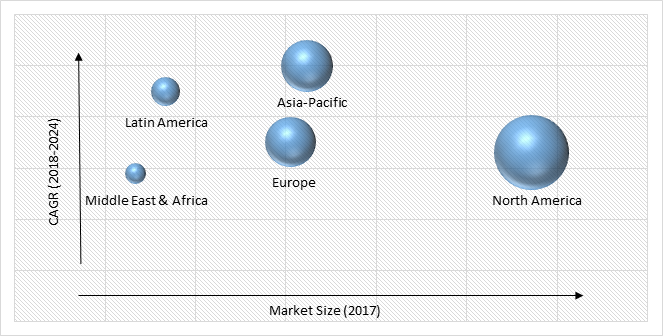 Moreover, Asia-Pacific is expected to witness the fastest growth in the gamification market due to increasing penetration of the internet in this region along with extensive demand for mobile devices. The growth of this market in the region is expected to at a CAGR of more than 40% during the forecast period. The gamification market is consolidated and the key players offering these solutions are Bunchball Inc., Badgeville Inc., Kuato Studios, SAP SE, Cisco Systems Inc., Gigya Inc., Microsoft Corporation, Knewton, BigDoor Inc., and Lithium Technologies Inc. Note: Financial insight, are subject to availability of information in secondary domain. Table 256 Snapshot – Bunchball Inc.
Table 257 Snapshot – Badgeville Inc.
Table 261 Snapshot – Cisco Systems Inc.
Table 262 Snapshot – Gigya, Inc.
Table 265 Snapshot – BigDoor Inc.
Table 266 Snapshot – Lithium Technologies Inc.